삼국유사 권4~5(三國遺事 卷四~五)는 14세기말(조선초) 경주(慶州)에서 간행된 것으로 삼국유사(三國遺事)의 현존본 중 가장 빠른 간본(刊本)인 동시에 보존상태가 양호하여 초기본들의 훼손된 부분과 결락(缺落)된 부분을 보완함은 물론 동시에 정덕본(正德本)의 오류를 바로 잡을 수 있는 귀중한 책이다. 삼국유사 권제4-5까지 2권을 1책으로 묶은 것으로, 권4가 31장, 권5는 전체 30장에서 2장(제26-27)이 결락된 28장의 도합 59장인데 첫장 상단의 묵서(墨書) 기록으로 보아 광무(光武) 11년(1907) 오성월(吳腥月)이 입수하여 범어사(梵魚寺)에 기증한 책임을 알 수 있다. 형태적인 면에서 광곽(匡郭)의 길이가 정덕본에 비하여 대체로 크고, 변란(邊欄)도 모두가 쌍변(雙邊)이다. 내용적인 면에서는 정덕본과 문자상(文字上) 많은 차이가 보이고 특히, 고려왕(高麗王)들의 어휘(御諱) 대부분에 피휘(避諱)가 적용되지 않고 있는 점으로 보아 조선초기의 간행본임을 알 수 있다. 이 책에는 조선초 판본(板本) 중 유일하게 권4의 이혜동진(二惠同塵)·자장정률(慈藏定律)·원효불기(元曉不羈)·의상전교(義湘傳敎) 등의 편에 구결(口訣)로 현토(懸吐)가 되어 있으며, 권제5의 제27-30장이 있는 것은 범어사본이 유일하다. 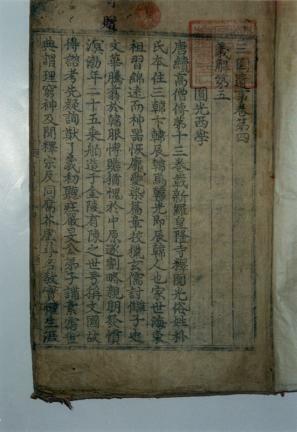 Volumes 4~5 of Samguk yusa (Memorabilia of the Three Kingdoms), published in Gyeongju at the end of the 14th century (early Joseon Period), are the earliest extant editions of Samguk yusa and are surprisingly well preserved. These precious volumes compensate for the damaged and missing parts of the early editions and also provide guidance on correcting mistakes in the Jeongdeok Edition. Volumes 4 and 5 of Samguk yusa were bound into this one book consisting of 59 pages, i.e. 31 pages of volume 4, and 28 pages (originally 30 pages in total, of which pages 26 and 27 are missing) of volume 5. According to the inscription in ink on the upper part of the first page, this book was acquired in 1907 and donated to Beomeosa Temple. In terms of the contents, as the use of kings’ names of the Goryeo Dynasty was less avoided (i.e. 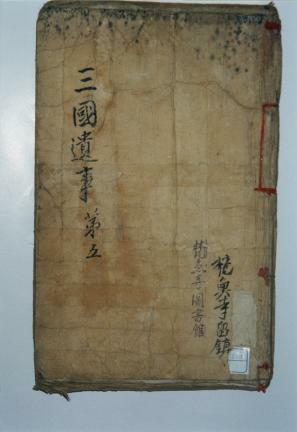 due to a naming taboo) and there are many differences compared to the Jeongdeok edition published in Gyeongju in 1512 (the 7th year of the reign of King Jungjong), the book was published during the early Joseon period. Some parts of volume 4 contain Korean endings on Chinese characters, and only the Beomeosa Temple edition includes pages 27 to 30 of volume 5.